Here are some snazzy birthday facts about 6th of August 1986 that no one tells you about. Don’t wait a minute longer and jump in using the content links below. Average read time of 10 minutes. Enjoy! What day was my birthday Aug 6, 1986? August 6, 1986 was a Wednesday and it was the 218th day of the year 1986. It was the 32nd Wednesday of that year. The next time you can reuse your old 1986 calendar will be in 2025. Both calendars will be exactly the same! This is assuming you are not interested in the dates for Easter and other irregular holidays that are based on a lunisolar calendar. There are 108 days left before your next birthday. You will be 33 years old when that day comes. There have been 11,945 days from the day you were born up to today. If you’ve been sleeping 8 hours daily since birth, then you have slept a total of 3,982 days or 10.90 years. You spent 33% of your life sleeping. Since night and day always follow each other, there were precisely 405 full moons after you were born up to this day. How many of them did you see? The next full moon that you can see will be on May 18 at 21:13:00 GMT – Saturday. Fun stat: Your first one billion seconds (1,000,000,000) happened sometime on April 14, 2018. If a dog named Princess Daisy - a Bouvier des Flandres breed, was born on the same date as you then it will be 188 dog years old today. A dog’s first human year is equal to 15 dog years. Dogs age differently depending on breed and size. When you reach the age of 6 Princess Daisy will be 45 dog years old. From that point forward a large-sized dog like Princess Daisy will age 5-6 dog years for every human year. The Republic of Pisa is defeated in the Battle of Meloria by the Republic of Genoa, thus losing its naval dominance in the Mediterranean. Bolivia gains independence from Spain. World War I: First Battle of the Atlantic: Two days after the United Kingdom had declared war on Germany over the German invasion of Belgium, ten German U-boats leave their base in Heligoland to attack Royal Navy warships in the North Sea. Jamaica becomes independent from the United Kingdom. US President Lyndon B. Johnson signs the Voting Rights Act of 1965 into law. What does my birthday August 6, 1986 mean? 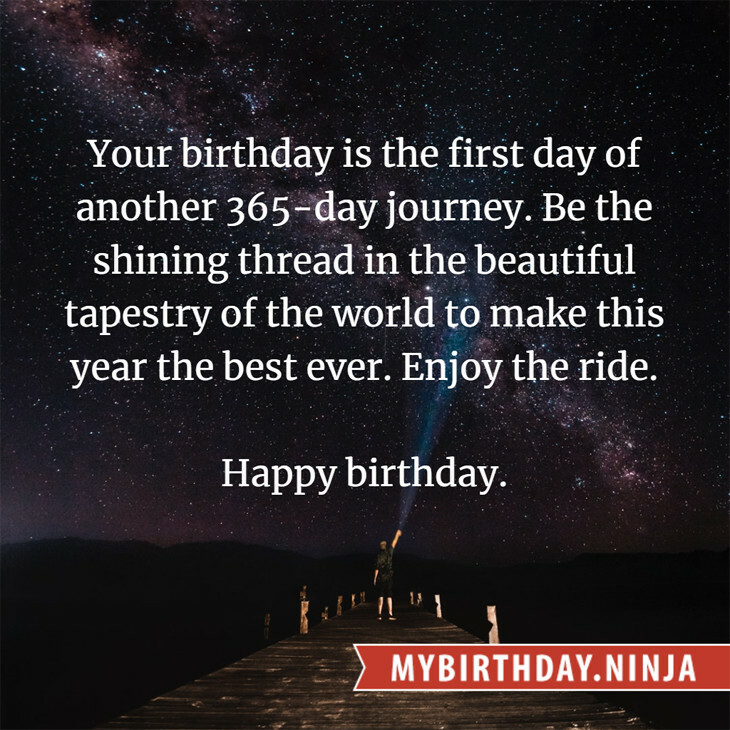 Your birthday numbers 8, 6, and 1986 reveal that your Life Path number is 2. It represents balance, harmony and partnership. You have the soul of an artist. You are a fine companion and possess a good sense of humor. Friends seek you out for your calming and peaceful company. The following celebrities also have the same life path number: Martin Moran, Dinah Sheridan, Arden Cho, Maurice Pialat, Tom Krause, Tehilla Blad, Shannon Leto, Yukihiro Takahashi, S. Epatha Merkerson, Arjun Rampal. 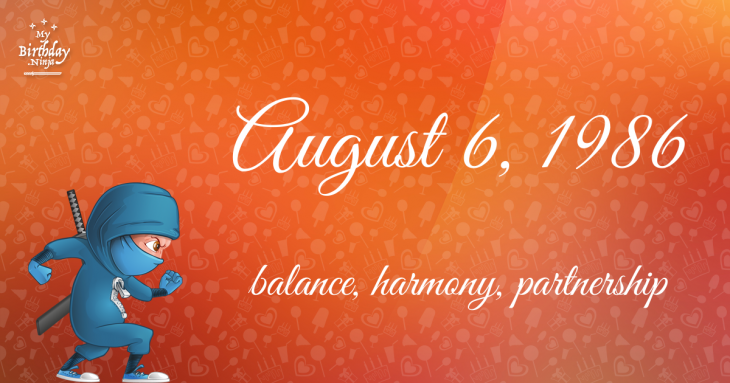 What is the birthday horoscope for Aug 6, 1986? The Western zodiac or sun sign of a person born on August 6 is Leo ♌ (The Lion) – a fixed sign with Fire as Western element. The ruling planet is Sun – the center of our universe. According to the ancient art of Chinese astrology (or Eastern zodiac), Tiger is the mythical animal and Fire is the Eastern element of a person born on August 6, 1986. Fun fact: The birth flower for 6th August 1986 is Poppy for preparedness. The number-one hit song in the U.S. at the day of your birth was Glory of Love by Peter Cetera as compiled by Billboard Hot 100 (August 9, 1986). Ask your parents if they know this popular song. How many babies were born on August 6, 1986? Base on the data published by the United Nations Population Division, an estimated 137,616,130 babies were born throughout the world in the year 1986. The estimated number of babies born on 6th August 1986 is 377,030. That’s equivalent to 262 babies every minute. Try to imagine if all of them are crying at the same time. What is the popular baby name on 6 Aug 1986? Here’s a quick list of all the fun birthday facts about August 6, 1986. Celebrities, famous birthdays, historical events, and past life were excluded. Try another birth date of someone you know or try the birthday of these celebrities: April 27, 1986 – Jenna Coleman, English actress; May 3, 1968 – Shane Minor, American singer-songwriter; July 16, 1930 – Guy Béart, Egyptian-French singer-songwriter (d. 2015).